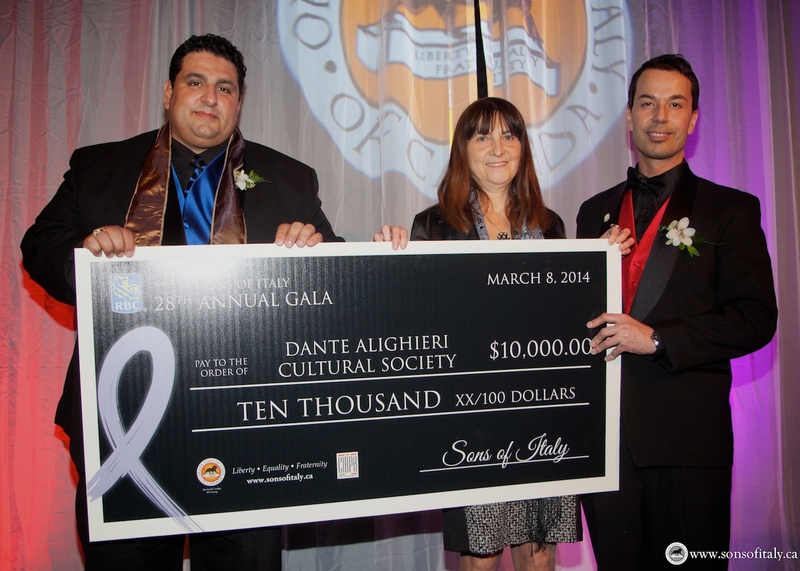 Winnipeg is still talking about the Sons of Italy 28th Annual Gala Dinner at the RBC Convention Centre. The weather on March 8th was a little colder than last year’s Gala date, but that didn't seem to bother the 1,100 plus guests that came prepared for a great night of giving, food, drinks, warm-hearted laughter and fantastic entertainment featuring comedian Frank Spadone and The Amici band. Father Sam Argenziano was once again our Master of Ceremonies. We have been treated by his fantastic sense of humour in the past and he did not disappoint. However, there was a moment in the evening where he changed the tone. Father Sam asked for each survivor of cancer to please stand up. He then asked people that were affected by cancer of a loved one or friend, to stand. Almost the entire room of over 1100 people were standing up! This was a powerful and memorable moment of the evening. Our Gala did not have a key note speaker so we could focus instead on entertaining, bringing in Canada’s premier Italian comic, Frank Spadone. Frank did a tremendous show. He brought the packed room to tears of laughter, trying to one up our emcee, Father Sam. We also were very excited to have the talented Amici Band back for our Gala night. They kept the room dancing and partying till the wee hours of the evening. 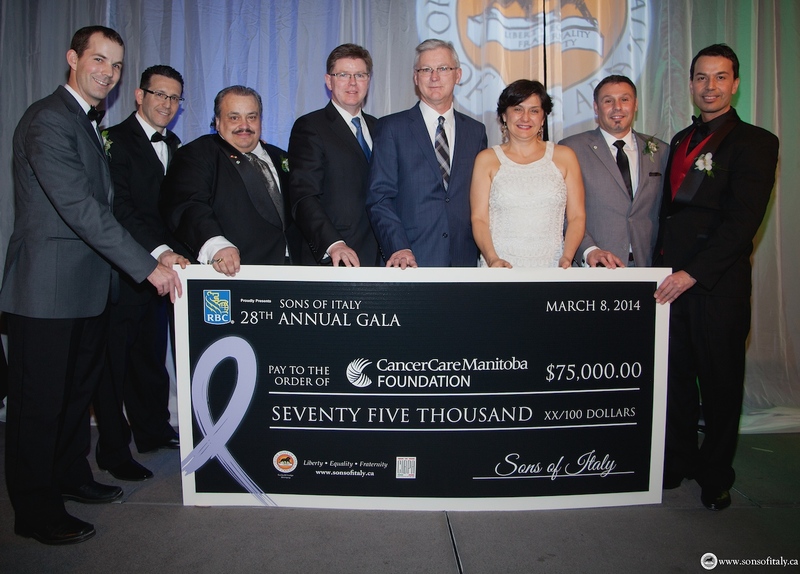 Sons of Italy, Garibaldi Lodge was proud to donate a cheque for $75,000 to CancerCare Manitoba Foundation. We have donated in excess of $100,000 to CancerCare Manitoba Foundation this year alone, and over $200,000 over the past five years. 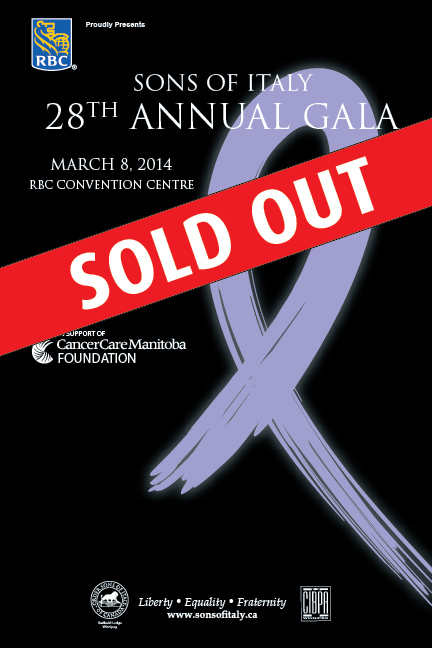 We salute all they do for the thousands of people who are going through cancer each day in Manitoba. Sons of Italy President, Tat-Liang Fabio Cheam, connected with the audience through his passion for the Sons of Italy and then presented the Vince Bova Memorial Award to John Giavedoni. John has contributed greatly to the Sons of Italy. He is our Christmas Eve Feast Co-Chair, a dinner to feed families in need. He is constantly working on the Sons of Italy website as our webmaster, a past treasurer, our photographer and most importantly, our friend. Congratulations John, you deserve this honour and we thank you. The Canadian Italian Business and Professional Association (CIBPA) award for the Entrepreneur of the Year was given to Giuseppe “Joe” Grande. Joe has been the owner of Mona Lisa Ristorante Italiano on Corydon Ave for over 30 years. Joe Grande is a successful restaurateur and also a proud supporter of the community and all things Italian. To date, events at Mona Lisa have raised over $180,000 dollars for a variety of charitable organizations and initiatives. He is a man who believes in the goodness of people and the joyfulness of life. Congratulations Joe for all that you do in our community! The night before the Gala, we held our annual President's Reception, an exclusive opportunity to thank many of our amazing Gala sponsors and VIPs. This year we also recognized our past presidents at a special ceremony as part of the President's Reception. Each of the past presidents were presented with a beautiful Sons of Italy commemorative ring for their contributions to our organization. Brothers Franco Petrelli and Carmine Zirino, Gala co-chairs, and their committee made this year’s Gala a huge success. A night like this wouldn’t be possible without our Sponsors and all the guests in attendance. Their contribution continues to make this evening a huge success. 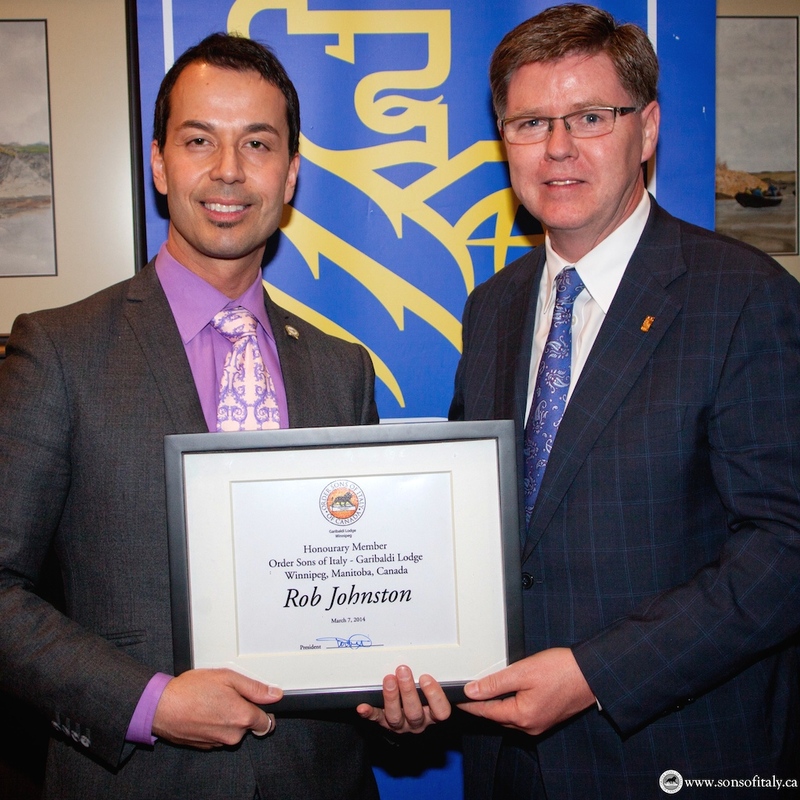 We thank Rob Johnston of RBC for all his continuing support as Title Sponsor of our Sons of Italy Galas for the past three years. At our President's Reception this year, we awarded Rob (Roberto?) Johnston with an honourary memberhip of the Sons of Italy, Garibaldi Lodge. Our Honourary Co-Chairs included Ida Albo, owner of The Fort Garry Hotel and Salvatore Infantino, owner of X-Cues Billiards and Café. Ida is an active Board Member of the CancerCare Manitoba Foundation and the Guardian Angel Benefit for Women’s Cancer. 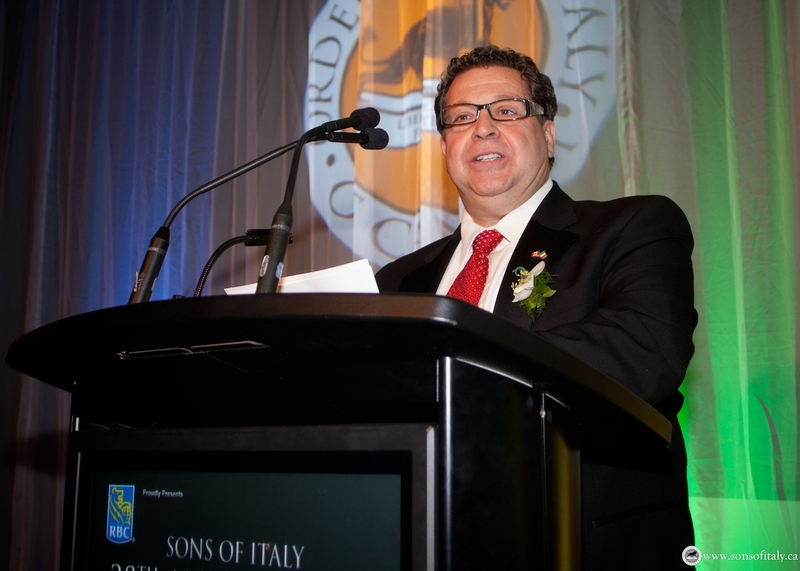 Sal is a member of Sons of Italy and has contributed greatly to our Italian Community in Winnipeg. We thank them both for helping make the night a huge success. We cannot put on an event like this without the support of many. We specifically wish to thank our sponsors, many who have supported us and our selected charities for many years. A very large thank you to RBC, our title sponsor! We greatly appreciate RBC's commitment to support the Sons of Italy Gala and by doing so, enabling us to give to our community with the charitable work we do. Thank you RBC! Please check out our full list of sponsors from this year's Gala, and support them, as they have supported us. Yes, the 2014 Gala is over, but the challenge to support those who are affected by cancer remains. 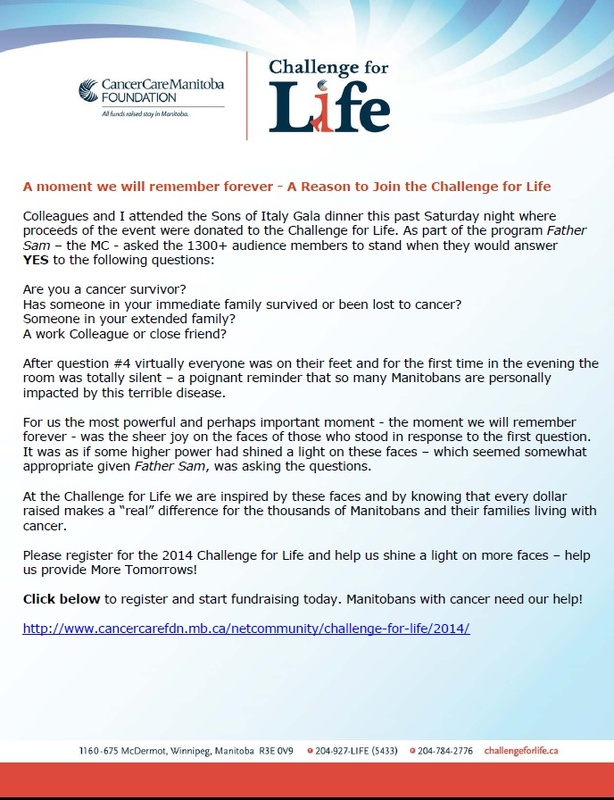 Click on the image on the left to read CancerCare's comments on a very moving moment at the Gala. Want to continue helping? Join our Sons of Italy team in the Challenge for Life walk in June. Last year we raised over $36,000 for CancerCare Manitoba Foundation to help fund the services and research that is so desperately needed by so many people in Manitoba. Click here to find out how walking with us can help.